EVP: (female voice)"Pass the paper." investigator #1: "We're now in the dining room." Investigator #2: "Did anybody just whisper?" (The investigator was wearing headphones attached to the digital voice recorder and actually heard the real-time EVP). Investigator #2: "I heard something. Is there anybody outside?" Investigator #1: "OK - we have 3 lights lit up (referring to the K2 meter). Now we have two (lights lit). " Investigator #1: "We should get those EVP questions out." Investigator #2: "Where are they at?" EVP(female voice): "Go take his picture"
Team #1 is investigating the dining room on the first floor. Team #2 is on the second floor. Just before Team #2 comes downstairs to switch areas with Team #1 we get this EVP in the dining room letting us know that Team #2 is coming. Investigator: "Do you like animals? I like animals. I like cats and I like dogs. Do you like dogs?" 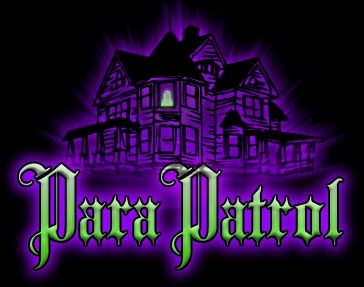 EVP:(male voice) "I HATE dogs"
EVP: (male voice) "Be afraid when you come into this room." Investigator: "If you answer 'yes', knock once. This is followed immdiately by a knock. Investigator: "If you answer 'no', knock twice." This is followed immediately by one knock. Investigator #1: "Is there anyway that we can help you?" Investigator #2: "That was a knock"
Investigator #1: "Did you like it better when it was just Doug and I in here - just a couple of guys hanging out with you?" Investigator #2: "Was there another knock?" Team #1 was on the roofdeck and had the K2 meter on the chaise lounge. When investigator Jayne took a step towards it, the second light lit up. When she stepped back, the second lit went out. The same thing happened repeatedly as she stepped forward and then back. Investigator Jayne: "OK, I think I have died and we just don't know it." She said that because the K2 meter lights up when it detects EMF or supposedly spirits. You then hear the investigators talking about it.